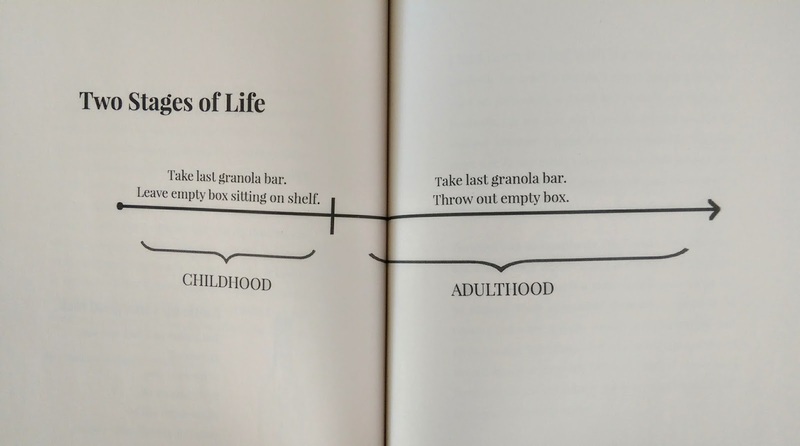 I really like a lot of Amy Krouse Rosenthal's books. I haven't read them all, because she's pretty prolific, but I definitely enjoyed Encyclopedia of an Ordinary Life and I love her picture books Spoon, Little Pea, Bedtime for Mommy and others. If I spot a book of hers I haven't read, I stop and check it out. Textbook Amy Krouse Rosenthal was no exception: I really liked it. I think I will probably pick it for my book club pick—my turn is coming up in January. The book is divided into sections: Geography, Social Studies, Art, Science, Midterm Essay, Romance Language, History, Music, Math, Language Arts and Final Review. In each section there are short pieces that could loosely fit in that category. Some are diagrams or charts, others take up a page or two, some are short enough to be a status update. The most unique element of the book is the texting (SMS) component. At certain spots in your reading you're invited to pause and text something to the number given, and you're promised something in return. For instance in the Language Arts section, she shares a favorite poem and invites you to text if you'd like to hear the author reading the poem -- she recorded him reading it over 15 years ago. I found this book very easy to read. I read it straight through, but you could definitely skip around in it, if you like. I read a good chunk of it while on a trip to NYC with my friend and former roommate Hilary. I ended up reading section after section aloud to her, because they amused and amazed me and, since we were sitting on hotel beds just a few feet apart, I saw no reason to keep the fun to myself. I also had to read some passages aloud to Jacob. It's just such an easy book to read that it almost feels like cheating. Some pages have very, very little text on them. But I loved it. I suppose if I had bought the book I might have been miserly and thought that less paper would have made it less expensive. I didn't buy the book though; the publisher sent me an advance copy for review. And I love the feeling of accomplishment I get when I finish a book, regardless of how little text was on any given page. 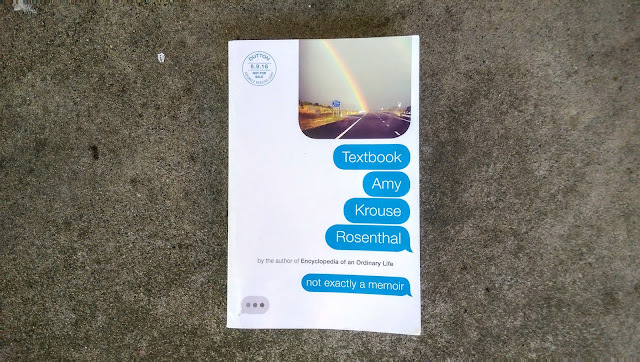 Textbook Amy Krouse Rosenthal came out August 9, 2016, and I recommend it. While there is no content in it that I'd be uncomfortable sharing with my kids, I think it will appeal most to adults who like thinking about life and art. I've read a couple of hers and liked them both. I'll have to check this one out!